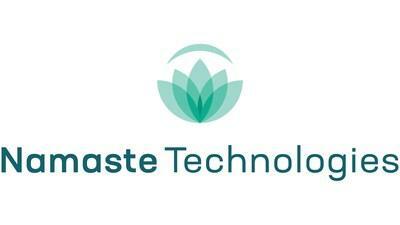 VANCOUVER , Oct. 30, 2018 /CNW/ - Namaste Technologies Inc. ("Namaste" or the "Company") (CSE:N.V), (M5BQ.F), (NXTTF) is pleased to announce the filing of its unaudited quarterly financial statements, management's discussion and analysis and certification of the quarterly filings for the fourth quarter of fiscal 2018. The statements for the period can be accessed on the Company's SEDAR profile at www.sedar.com. Namaste's net revenue for the three months ended August 31, 2018 was $3.9 million , which is comparable to $3.9 million within the same period in 2017. On a year over year basis, Namaste's net revenue for the twelve months ended August 31, 2018 was $18.6 million (an increase of $7.6 million or 69%) compared to the twelve months ended August 31, 2017 . The increase in net revenue during the twelve months ended August 31, 2018 was primarily due to organic growth within the key markets such as United Kingdom , Canada , Brazil , Germany and full twelve months of revenue from Australian Vaporizers which was acquired in March 2017 . Australia Q4-2018 revenue increase by approximately 3% compared to Q4-2017 without the impact of foreign exchange. The majority of the revenue was generated by several key markets. For the three and twelve months ended August 31, 2018 , the top five revenue earning countries generated 85% and 84% of revenue, respectively. For the three and twelve months ended August 31, 2017 , the top five revenue-earning countries generated 86% and 84% of revenue, respectively. For the twelve months ended August 31, 2018 , Namaste showed an impressive growth of 364% in the Canadian market, 261% in Germany , 188% in Brazil , 98% in Australia , 45% in the United Kingdom . These changes are consistent with Namaste's long terms business strategy to expand in European and emerging markets with an increased focus in the Canadian market. On September 13 th, 2018, the Company signed a binding terms sheet to Acquire UK-Based Licensed Pharmaceutical Distribution Company AF Trading Ltd. Access Fulfillment operates a 30,000 square-foot distribution facility in the UK and holds a Wholesale Distribution Authorization (Human) License issued by the Medicines and Healthcare Products Regulatory Agency ("MHRA") which allows Access Fulfillment to distribute pharmaceutical products throughout the UK. The Company is working to close on the acquisition and is focused on launching medical cannabis sales through its platform in the UK, which represents a much larger customer base than that of its Canadian operations. Sean Dollinger , President and CEO of Namaste comments: "We are pleased to have filed Q4, 2018 financials. With the completion of our bought-deal financing and our current cash position, the Company is well-positioned for future growth. We are now focused on increasing revenue through Cannmart and in launching medical cannabis sales in to the UK market."